Here is another ancestor who can be traced to his birthplace in England and this time thankfully most of the internet sites have his ancestry correct. 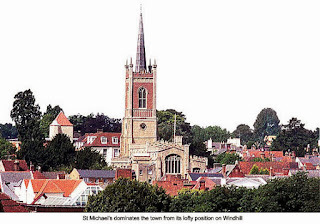 At least two of my ancestors, including George Abbott and his wife hailed from Bishop's Stortford in the county of Hertfordshire, England. The Reverend Francis Dane, who would later marry George Abbott's widow, Hannah Chandler Abbott, was also from Bishop's Stortford; he would become the minister of Andover for many, many years. John Norton, who sailed in 1634, was ordained and became a noted Puritan Divine in Ipswich was also from Bishop's Stortford. The Reverend John Elliott, who was the Puritian Minister at Roxbury was from the village of Widford about 7 miles from Stortford, it is possible that these three influential men were the driving force behind multiple family migrations from Stortford to the Massachusetts Bay Colony. George Abbott was baptized in the church St. Michael's on 22 May 1617. His ancestry in Bishop's Stortford can be traced back at least five generations to his ggg grandfather, William Abbott who was born circa 1470. The names of his ancestors, Williams, Johns and Georges are found in the Bishop's Transcripts and Court Rolls. They owned, bought and sold land. They were church wardens, they paid taxes and they were taken to court by their neighbors. 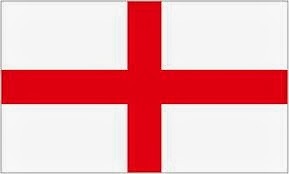 Good solid Englishmen, rooted in their village for hundreds of years, what would it take to make them pack up and leave their home, forever? George was the third in a line of George's and of course he named one of his sons George. His father, George, was born in 1587 and married a woman named Elizabeth, her surname is unknown, she may have been the immigrant George's mother. In any case, George the father has no known will or record of his death. This lack of information has lead to the confusion of George Abbott of Bishop's Stortford with another English immigrant of the same name who arrive about 1642 and died in Rowley five years later in 1647. This second George came over with his four sons: Thomas Sr., Thomas Jr., Nehemiah and, of course, George. Prior to his death George Abbott of Rowley deeded most of his land to his eldest son Thomas Sr.. The remaining sons were not yet of age and were apprenticed or taken in by men in Rowley. This family of Abbotts is not the same as the George Abbott of Roxbury and Andover. Confused, me too and adding to the confusion is the fact that George Abbott, son of George of Rowley, moved to Andover in 1655. He was called George Jr. and our George was called George Sr.
George was known to be in Roxbury, his marriage to Hannah Chandler was recorded by the Rev. John Elliot in 1646. The Chandler family was also from Bishop's Stortford and they had arrived in Roxbury in 1637. He is said to have come on the same ship as the Chandler's but I cannot find any mention of him in any records. He would have been 22 in 1637, so what was he doing? He wasn't married. He didn't join the church at Roxbury, so he could not have been made a freeman. He wasn't given any land grants in Roxbury, if he was there he kept a low profile. It is possible that he lived with and worked for the Chandler family, until he was able to establish his own homestead. 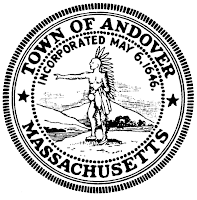 In her article "The Two George Abbott Families of Andover" Marjorie Wardwell Otten, writes that because George was unmarried at the time he relocated to Andover in 1643, he required a sponsor to attain land. His sponsor was John Dane, who had recently married Annis Chandler, widow of William Chandler. He also sponsored Thomas Chandler, his then step-son and brother of Hannah Chandler. With John's help George was able to get a four acre home lot. In 1646 George, now aged about 30, married Hannah aged 16. The difference in their ages seems to stand out, especially in light of the fact that George would be in prison today for committing a serious sexual offense. I wonder why he married her, was there a shortage of marriageable women, did he fall in love with her while she was growing up and he waited for her to become of age? Who knows, but judging by his will they had a good marriage. They also had 13 children, 10 boys and 3 girls. George did not seem to hold many town offices in Andover. He served on the Grand Jury of the Quarterly Court in Ipswich in 1658. In 1673 he was chosen surveyor and in 1676 branding man, both jobs important but not quite elite. However, the town records only go back to 1656, 13 years after he settled there. It is possible that he held other civic jobs prior to the beginning or the records. George and his sons took the Oath of Allegiance 11 Feb 1678/9, a requirement for all males over the age of 16. 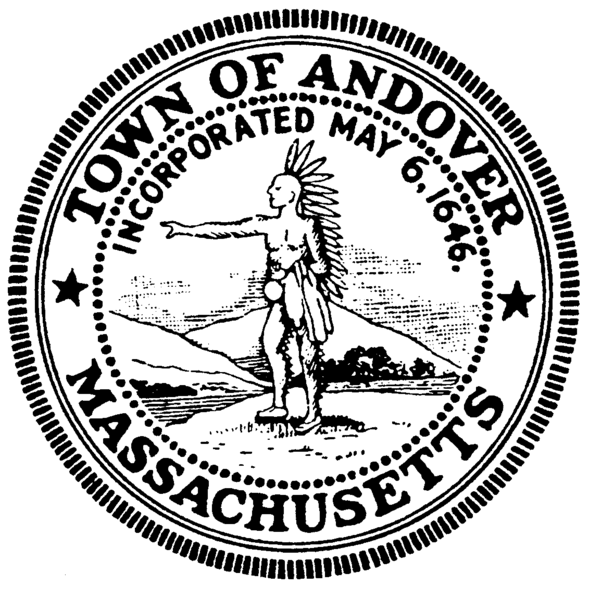 The town of Andover, which is about 27 miles from Roxbury, was first settled in about 1641, the land was purchased from the Indians for 6 pounds and an old coat. In a list of the original settlers, George's name is 19th. Unfortunately the first town meeting was not recorded until 1656 so details of the early days are sketchy. In 1646 Francis Dane, step-brother of Hannah Chandler Abbott became the minister of Andover, a position he held for many years. 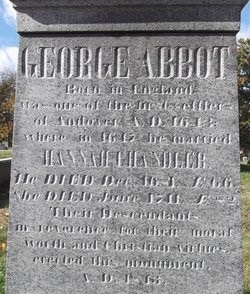 In about 1655, George Abbott Jr. arrived in Andover, he was also called George Abbott "the tailor", after his profession or George Abbott "of Rowley". He became a sexton in the church as were his sons after him. Other townsmen of note were the Blanchards and Lovejoys to whom I am also related. 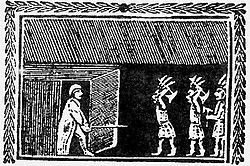 After many years of, if not good but tolerable, relations with the native Indian population, things began to become troublesome around the year 1675. Sometime before 1663 George Abbott purchased a house on the south end of Andover. This new house was designated as a garrison house, a place of safety in the event of an Indian attack. Garrison houses were built to withstand an assault, with thick log walls. They were usually enclosed by a wooden palisade and could accommodate multiple families. In 1675 there were 12 garrison houses in Andover, including the Abbott's. In December 1675 Joseph Abbott was impressed into military service and took part in what is called "The Great Swamp Fight" during King Phillip's War. The colonial militia attacked a Narragansett fort in Rhode Island. The outcome was a victory for the colonial forces and resulted in the demise of the Narragansett people. Joseph returned safely from the expedition. On 10 Feb 1676 King Phillip and his forces attacked and wiped out the town of Lancaster, MA which was some 37 miles to the southwest of Andover. Word spread rapidly that the Indian war parties were on the move. The news was unsettling if not terrifying. On 18 March two Indian scouts were spotted near Andover. The town sent two riders to Ipswich to ask for aid to help defend the town. On 8 April 1676 the long dreaded Indian attack occurred. An alarm was raised when the Indians were spotted crossing the Merrimack River and all who heard it fled for the safety of the garrisons. Joseph and Timothy Abbott were working in the fields and were unable to make it to the garrison. Joseph turned and fought the Indians, reportedly killing at least one before he was overcome and killed. His young brother Timothy, age 13, was taken into captivity. Timothy was returned to Andover in August of 1676 by an Indian Squaw who apparently took pity on him, he was described as being "much pined with hunger", but otherwise alright. George Abbott wrote his will on 12 December 1681, he was only 64 years old, but he obviously knew he was dying. His will is a testament to his love and esteem for his wife of 35 years, Hannah Chandler Abbott. He wrote "considering the great love and affection I have unto my loving wife Hannah Abbut, and the tender love she hath had to me and her care and diligence to me to get and save what God has blessed us with and also her prudence in management of the same, I leave her my whole estate for life..." Wow, his whole estate, that almost never happened. She would of course divide the estate among her sons, the oldest John was to get a double portion. George died on the 24th of December and was buried in the Andover burying grounds. On the 200th anniversary of the founding of the town of Andover his descendants erected a memorial to him. Hannah became a widow at the age of 52, she chose to remarry in 1690 her step-brother the Reverend Francis Dane, who had recently lost his second wife. Francis was born in Bishop's Stortford in 1615, his father, John, married Hannah's mother, Annis, in Roxbury after the death of her father, William Chandler. Hannah had probably known Francis her whole life. They were 60 and 75 years of age when they married, I'm sure they were looking for quiet companionship in their old age. It's not quite what they got. In 1683, when Benjamin was 22, he engaged in a sexual relationship with a widow, Naomi Holt Lovejoy, she was 30. In June of 1683 she was fined in court for fornication with Benjamin Abbott, she was also pregnant with his child, a daughter born in 1684. The daughter's name was Ben Naomi Abbott. Benjamin married Sarah Farnham in 1685, Naomi also remarried. About 1690 Martha Allen Carrier and her bedraggled family came to town. At first they were warned out, but later the town recanted and gave the family a small plot of land. The Carrier family contracted small pox and several family members as well as other inhabitants of Andover died of this disease. Blame fell on Martha, who appears to have been a difficult woman to deal with. The town gave Benjamin Abbott a piece of property that bordered Martha's land. This did not sit well with her and she began to direct her malicious talk against Benjamin. Saying she would hold his nose to the grindstone. Words which would come back to haunt her. In 1691 Benjamin came down with a hideous cause of carbuncolosis, boils. It began with a pain in his foot, and then his side. He developed a boil which when lanced yielded "several gallons of corruption". Boils also appeared in his groin. While he was suffering "near to death" his wife Sarah noted unusual behavior in their cattle, several of which died. In August of 1692 the witch trials in Salem were at their zenith. The minister of Andover, Reverend Barnard, invited the Salem accusers to come to Andover to seek out any witches that might be living there. Needless to say, Benjamin laid his troubles on Martha and called her, she was, he said, a witch. He and Sarah testified against her on August 3rd 1692, as did many others. Martha was found guilty and hung on August 19th. Francis Dane, now Benjamin' step-father, was not a fan of the witch trials, in fact he had serious doubts about the validity of the accusations, the confessions and the evidence on which the trials, like that of Martha Carrier, were based. His stance against the trials brought a backlash of accusations against him and his family. Two of his daughters, his daughter in law and five of his grandchildren were accused of witchcraft. Francis' opposition to the trials went into overdrive and he is credited with helping to bring the madness of the accusations and trials to a halt. I wonder if he and Benjamin Abbott ever spoke of what occurred and what part Benjamin played in bringing about the death of an innocent woman. Hannah outlived her second husband Francis who died in 1697. She died on 2 June 1711 at the age of 81. Not much can be said about her life from her perspective, but she did do one pretty remarkable thing. In 1706 she deeded land to her sons Timothy, Nathaniel and Thomas. This was apparently the only time land was deeded solely by a woman. Hannah was survived by nine children. Well I'm back again, poking around in the far past after writing a few blog posts about my more recent ancestors. I have taken up the slog again, writing about my more distant kinfolk. My ancestor under scrutiny this time is William Cheney who immigrated from England to Roxbury, MA. John Cheney, who lived there briefly, is often identified as his brother or close kinsman. A quick glance at ancestry.com shows me that as usual there is a lot of chaff to wade through before I find the nugget of truth. A quick search of the internet results in three very different locations sited as the birthplace of John and William Cheney. The most popular seems to be Bennington, Lincolnshire, second is Lambourne, Berkshire and finally Waltham Abbey in Essex. In his book "The Cheney Genealogy", Charles Henry Pope, noted genealogist, identified multiple Cheney families in England from whom it was possible that immigrants John and William Cheney might have come from including Benningon, Lambourne and Waltham Abbey. 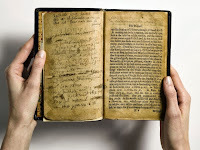 Just before he explores these families he stresses "no link has been found which connect William of Roxbury or John of Newbury with any English family". He then goes on to give an unbiased overview of all the Cheney families that were found. Obviously family researchers have picked the Cheney family that they like best and just run with it. I have even seen sites where a family identified with one location was uprooted and transferred to another, sort of an ancestor mash up. The editor of William's findagrave bio claims he is from some place called Maynall Longley, Derbyshire. There is no such place. There is a Meynell Langley in Derybshire. Most of the info in the bio is questionable and there is no documented evidence to back it up. And really, if you can't even spell the name of the place correctly how am I supposed to have any faith in your information. My 'go to guy' in times like these is Robert Charles Anderson of the Great Migration series. Anderson has not written about William as an immigrant as he does not show up in the records until 1639, but he did a bio on John Cheney who landed in Massachusetts in 1635. He states that the English origins of John Cheney are unknown. He also says that John and William may have been brothers. Good enough for me, although I was kinda hoping it would be Lambourne, as that is where Miss Elizabeth Bennett reunites with Mr. Darcy, but oh well, that is just another fantasy. In a 2001 article in The American Genealogist entitled "The English Origin of John Cheney of Roxbury and Newbury, Massachusetts", author Leslie Mahler identifies John as the John Cheney who lived in Lawford and Mistley, Essex. She located a previously unknown marriage of John Cheney to an Amy Unknown and the baptism of their children, John, Mary and Martha. After Amy's apparent death John was recorded as marrying Martha Smithe. 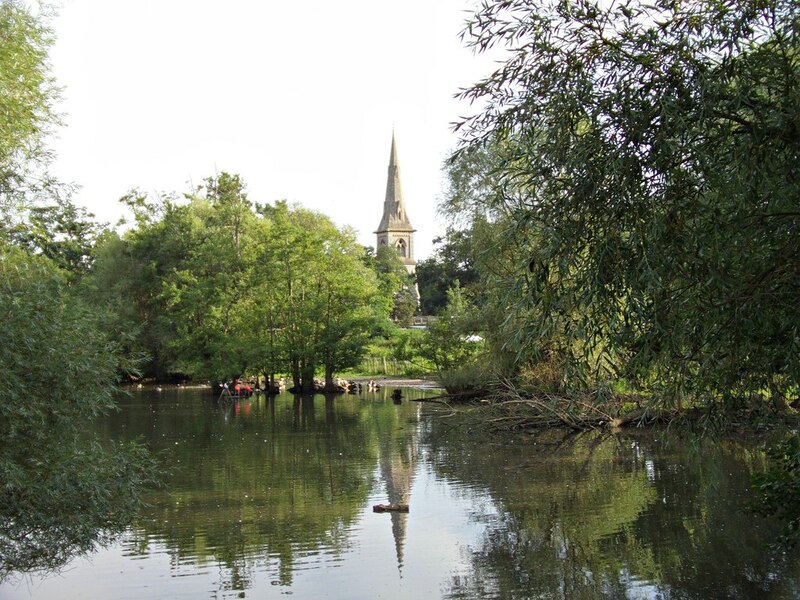 The baptism of their son Peter is found in the Lawford parish records, all subsequent children were born in Massachusetts, including a second son named Peter. 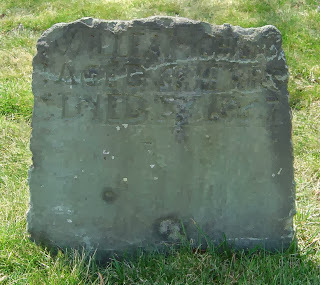 In a 2008 article in the New England Historical and Genealogical Register, "Various Wills Relating to New England Colonist", the same author, Leslie Mahler, states that the will of one George Lansdalle of Lawford confirms this identity by naming John Cheney, shoemaker, in his will. John Cheney of Newbury, MA was indeed a shoemaker by trade. Robert Charles Anderson's comment on first bit of information was that it was not impossible for John of Newbury to be the John from Lawford but that more research was needed. I wonder what his opinion is now in light of the discovery of will of George Lansdalle? Pope did not seem to believe that there was any evidence to declare outright that they were brothers. John arrived first and only lived briefly in Roxbury and then moved on to Newbury. Pope's only comment on their relationship was that if they were brothers "they do not say it or act it". William seems to have arrived at a later date and is only recorded as living in Roxbury, why not Newbury where John, if he was his brother, lived? Pope also commented on the theory that John and William shared a house in Roxbury until such time as John left for Newbury, he said "Theories are easy to handle; but they are of little historic weight". I guess the answer is we don't know if they were brothers and there is no way to prove it, and in genealogy if you can't prove it you can't say it. 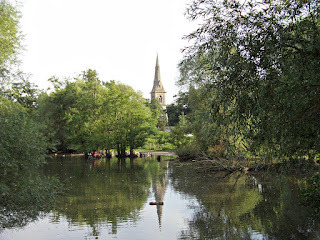 Leslie Malher stated in her article concerning John's origins that there was no sign of William Cheney in any of the parish records or other records that she could find, leading her to believe that William was not from Lawford. In fact she states that the name Cheney is rarely found in that area of Essex and the trail ends there. No parents have been identified for John. I think I will repeat that last sentence: NO Parents have been identified! Got it...good. William and Margaret met and married in England by the year 1626, based on the estimated birth year of their oldest child. Their arrival in Massachusetts is impossible to pinpoint, they are not listed on any ship manifest and William's name cannot be found in any record prior to 1639. William and Margaret had at least seven children, the first one named in a Massachusetts record was the fifth child, John, born September 29, 1639 in Roxbury. 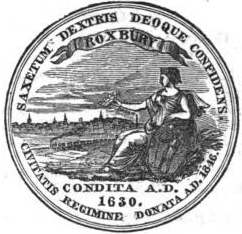 Roxbury was one of the original towns founded by the Winthrop group after their arrival in Massachusetts in 1630. The name was originally spelled Rocksbury and was so called because of the extremely rocky soil. The original settlement was close to the Boston Neck, Thomas Dudley said it was two miles from Boston, and spread westward into what is Jamaica Plain. The town center was called Meeting House Hill, today it is known as John Eliot Square. In July of 1639 William bought a house and house lot from the Parker Brothers of Boston. He is known to have lived on what is now Dudley St. near it's intersection with Warren St. but I am not sure if this was the lot he bought in 1639. In a audit of landowners in Rocksbury, done between 1634-1640 there were about 69 men who held acreage from 3 acres up to 356 acres, William's estate was a modest 24 1/2 acres. At his death, William had land scattered around Roxbury and in Boston. In his will, written in 1666/7 not too long before he died, William makes provisions for his "dear afflicted wife". What was she afflicted with? The only clue comes in a church record when it was recorded in 1673 that "Margaret Cheaney widow having long been bound by Satan under a melancholick distemper (above 10 or 11 yeares) which made her wholly neglect her calling and live mopishly, this day gave thanks to God for loosing her chain and confessing and bewailing her sinful yielding to temptation". So, Margaret at about age 60 seems to have had some sort of mental breakdown, possibly entering a chronic depression of some sort. This apparently began several years prior to her husband's death and lasted until about 6 years afterwards. The only thing surprising about this is that more women weren't likewise afflicted. Just think how hard and awful their lives were. I get depressed just thinking about what it was like to live in that age. At any rate, she seems to have recovered her senses and got on with what was left of her life. Margaret also revived enough to remarry sometime between 1673 and 1679 when she was identifed in a deed as a widow. Her second husband's surname was Burdge, nothing else is known about him. In 1632 the Puritan Church in Roxbury finally had it's meeting house and it's minister, the Reverend John Eliot. Eliot recorded each new member as they joined. Church membership was more than just a religious experience, it's significance was far reaching. No man could become a Freeman of the Colony without first becoming a member of a church and for a while your children could not be baptized unless one of the parents was a member. Of course everyone had to go to church, whether or not you were a full member, but becoming a member required a full disclosure of your sins, sort of a baring of the soul. Not everyone was prepared to go through with what must have been an uncomfortable event. Margaret became a member within a few years of arriving in Massachusetts. William however put off becoming a member for almost 20 years, finally taking the plunge in January of 1664/5. 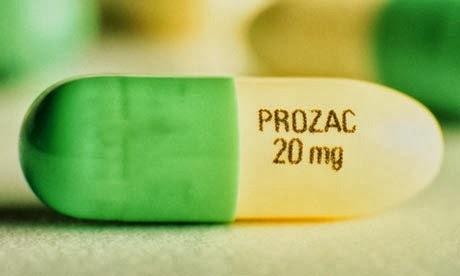 Did he feel his years creeping up on him, was his health beginning to fail, did his thoughts turn to the state of his soul, who knows what his reasons were, he just finally took the plunge. He became a freeman in May of 1666 and died the following year. Despite his lack of church membership and the fact that he was not a Freeman of the Colony, William seems to have been a good citizen of Roxbury. In 1645 the town established their first school. At that time the costs were covered voluntarily by the town's people. William was not only a contributor to the school but served in the office of Feoffee. Feoffee is an old word that doesn't get much use these days. A Feoffee is a trustee, so William was a trustee or administrator of the new school. William was elected and served as the town constable. We associate the job of constable with law enforcement and police work. In 1630 the job was a bit different. The constable collected taxes, served writs and warrants as well as enforced local laws. He did this in addition to working his farm or other form of employment. Often times men would refuse to serve as constable after they were elected and were fined for turning down the job. William also served as a selectman for the town for one term. William had his will written on 30 April 1667. He was not able to sign but made his mark. In his will he indicated that he was sick and he probably felt the time had come to face the inevitable, despite being only about 63 years old. William divided his estate among his children and left provisions for the care of his wife. He asked that one of his children live in the Roxbury home with Margaret to care for her. William died shortly after writing his will, the inventory of his estate was taken only a few later on 30 July of 1667. The executors of his will were Thomas Cheney his son and Thomas Hastings, husband of his daughter Margaret. Margaret Cheney Burdges moved to Boston by 1682 when she was released by the church at Roxbury and joined the South Church of Boston. Her son Thomas had to post surety to the town of Boston that his mother would not become a burden to it's citizens. Margaret signed her will, or rather made her mark, and died in July of 1686 in Boston. She was buried in Roxbury next to her husband William Cheney.